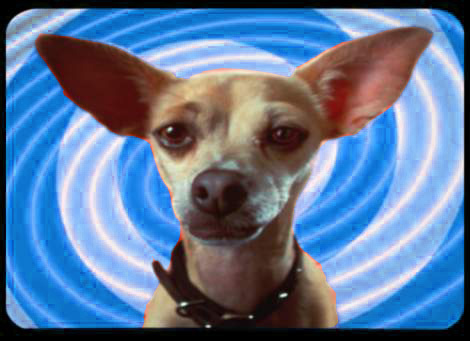 What I loved about those commercials was that I could respect that chihuahua. Unlike the Trix Rabbit (who just reinforces for children the utter futility of chasing their dreams) and Lucky the Leprechaun (the unholy little sprite who uses dark arts to keep those poor kids from ever enjoying a single bowl of his precious cereal), that little unnamed dog was actually likable. I could see myself hanging out with him. He had some moxie and some attitude. While other chihuahuas spend their time languishing in heiresses’s purses, this little guy had a goal and he pursued it relentlessly. That little rat dog resonated with a lot of people. In fact, he was such a well-liked mascot that people actually paid money to buy T-shirts and backpacks and bumper stickers bearing his likeness. When you can actually get people to pay you money for the privilege of becoming a walking advertisement for your product, you’re doing something right. Hurray for America. But then America did something incredibly wrong; at least the American church did. Shortly after the Yo Quiero Taco Bell phenomenon had peaked with the rest of the populace, I started seeing Christians wearing T-shirts with a little chihuahua saying, “Yo quiero Jesus!” Riiiight. So what we’re saying is that you can take out the name of a fast food restaurant whose only contribution to society is 435 ultra-fattening ways to eat the same six ingredients in slightly different configurations...and replace it with the Name Above All Names. Just pop out “Taco Bell” and pop in the Alpha and Omega, who was, and is, and is to come; the Living One, who was dead and behold he is alive for ever and ever and holds the keys of death and hades. Now, if you had that T-shirt, I’m not trying to make you feel bad. The fact is that I’ve owned more Christian T-shirts than you. I had them all: Lord’s Gym, His Pain-Our Gain, Jam for the Lamb, and, of course, the really graphic picture of Jesus being scourged that read, “Before you turn your back on Jesus, take a look at His!” Yeah, at one point, I could have probably gone three weeks wearing only Christian T-shirts and never repeating. Jesus Is the Answer - But, wait. What if the question is ,“Who was the worst hypocrite to ever live?” Well, then Jesus isn’t the answer. Someone didn’t think that one through. The Next Time You Think You’re Perfect, Try Walking On Water - I suppose that’s kind of clever, but... what’s the point? Is there a big problem with drivers thinking they’re perfect or something? Got Jesus? - I suppose I could go off on another rant about copying the world and swapping a product name in for Jesus...but I’ve still got a soft spot in my heart for this one. I’m not sure why. If You’re Living Like There Is No God...You Better Be Right! - Black writing on white with flames in the background. I’m guessing hundreds of people saw this sticker and immediately repented. Thousands, maybe. Dozens? Warning: In Case of Rapture, This Car Will Be Unmanned - Okay, even though I don’t believe in a pre-tribulation “Rapture,” I still find this to be a funny sticker. My beef is rather with the clumsy way in which corporate Christendom has to squeeze every penny out of every good idea. Case in point: there was a companion keychain you could buy that read, “Warning: In Case of Rapture, These Keys Will Be Unnecessary.” Huh?? How is that a “warning?” Oh, no! Not [gasp!] unnecessary keys!! A Jesus Fish Eating a Darwin Fish - Ya know, because if I decide that someone’s scientific theory is at odds with Scripture, that means Jesus should eat that person. What?? Honk If You Love Jesus - That way, if I cut you off and you honk at me, I can just assume you’re honking because you love Jesus. Try Jesus. If you Don’t Like Him, the Devil Will Always Take You Back - If you don’t understand why this reflects the worst possible theology, please schedule an appointment with me and I’ll explain at length. Calvin (the cartoon character) urinating on Satan or kneeling before a cross - What would Jesus do? Violate international copyright law, I guess. jesUSAves - Of course, there’s an American flag in the background. Church and state? Together? Aw, what’s the worst that could happen? Christian T-shirts haven’t gotten any better since I practically lived in them, either. Some of the worst include “Jesus Got-R-Done” (yeah, why not compare Our Lord to a vulgar, racist comedian? ), “Men fix everything with duct tape; Jesus used nails,” and “Body Piercing Saved My Life.” Then, of course, there are a whole slew of Christian T-shirts that re-define common acrostics and acronyms. These are so random and unmemorable that the only one I can bring to mind is “CSI: Christ Saves Individuals.” Individuals? That’s reaching. And what the world does it have to do with investigating crimes? Can’t we come up with one unique idea with some merit instead of constantly creating cornier versions of the world’s corniest offerings? If you’ve got any of the junk I’ve described above, I’m not judging you (not much, anyway). But I truly do believe that we need to get away from bumper sticker Christianity. The depth and mystery of our holy faith could never be boiled down into a pithy saying or clever one-liner. I don’t care if you’ve got a fish on your car or your bumper reminds us that your treasure’s in Heaven. I’m just saying 1.) Your driving better match the message on your bumper, lest you drive people away from the cross, 2.) We need to resist the modern urge to boil everything down to talking points, and 3.) How you live your life says infinitely more to the world about who you are and who Jesus is than the slogan on your T-shirt. It’s easy to slap “Free Tibet,” “Save the Whales,” or “Jesus Loves You” under your left brake light. But that $2 investment is an empty, meaningless slogan if it doesn’t point to a reality in your life.